Whiplash – What Will X-Ray Tell Me? Although whiplash injuries arising from motor vehicle collisions (MVC) are very common, there doesn’t seem to be consistency in the evaluation one receives at an emergency room (ER) or later in an outpatient setting when it comes to the utilization of x-ray and other imaging. So, what are the pros and cons of imaging a whiplash patient? A review of published guidelines suggests that if a person involved in a MVC presents to the ER awake, alert, with no neurological deficit or other distracting injury, with no neck pain or midline tenderness, and has a full range of neck motion, then x-ray is not considered necessary. If a fracture is suspected, an x-ray and/or CT (Computerized Tomography) scan is appropriate. Magnetic resonance imaging (MRI) has a role when a soft tissue injury such as a ligament tear, spinal cord injury, and/or arterial injury is suspected by clinical impression and/or prior imaging. The major concern involving trauma to the neck is fracture, but this is actually quite uncommon as a result of an MVC. Some ERs routinely x-ray all trauma cases to rule on the presence or absence of fracture, though CT scan is much more sensitive than x-ray, especially in subtle or the not-so-obvious types of fracture. Doctors and hospitals utilize treatment guidelines in an effort to provide the best possible care while limiting potentially unnecessary testing. For example, the Canadian C-Spine Rule (CCR) is an assessment to help determine who does vs. does not need x-rays in trauma cases. According to the CCR, those over 65 years of age or those who have significant trauma and/or numbness in the extremities should receive x-rays. Situations in which x-rays are not needed include a simple rear-end MVC; if the patient can walk around; delayed (not immediate) onset of neck pain; or the absence of midline neck tenderness. Another study reported that more than 800,000 patients in the United States (US) receive a cervical x-ray each year. Minimizing x-ray use is important, not just because of patient exposure to radiation, but because more than 97% of x-rays are interpreted as negative, and costs associated with x-ray exceeds $175,000,000 per year! Hence, there is a definite need for better guidelines in the US like the CCR! 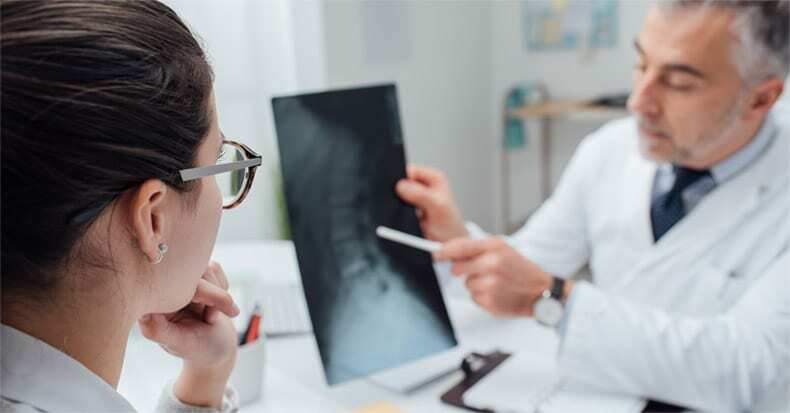 Doctors of chiropractic see many whiplash patients either soon after an injury or later, though sometimes it may be years before a patient with whiplash presents for care. For patients under age 65 who have a full range of cervical motion, no neurological deficits or complaints, no other distracting injuries, and no midline tenderness, in most cases, x-rays can wait.